Close out your summer with the playful charm of the Craze jelly sandal. This easy slip-on style comes with adorable metallic touched bow and thong to complement its color contrast strap, creating a lovely, lively look. In four vibrant colors, there's a Craze for any casual style: mint or coral to add a burst of color to flowing sundresses or complement a brilliant swimsuit, beige or black to add a subtler touch of spirit and charisma to your shorts or jeans. Kick up your heels in Craze and thoroughly enjoy the last of the summer sun! Available in sizes 5 to 11. Extremely happy with the service and my order. 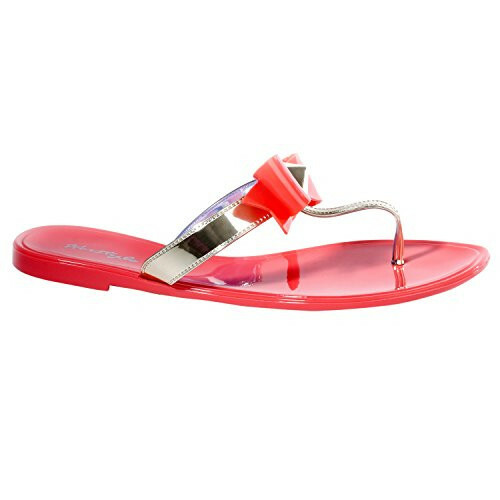 It is very pretty and preppy style and highly recommend to anyone planning to have stylish flat jelly sandal.